Sometimes, everything works out: Wow. Now this is something special. Rarely does such a ridiculous concept work out so well. First, the card series subset is for the Arizona "Fall" League, and it appears McCracken is falling. Second, the logo makes it look like McCracken is playing in the Arizona "Fail" League, which, really, would be more appropriate with this card. Third, the background is an arid landscape and McCracken plays for The Scorpions. No winds of change here. 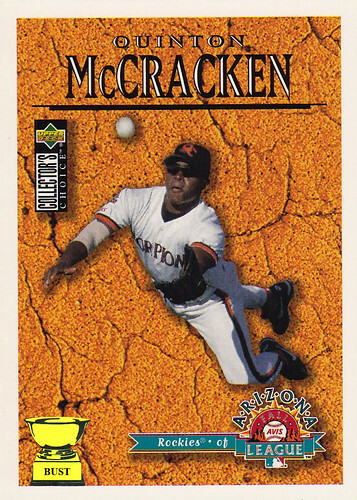 Last but, oh lord, definitely not least, this guy's last name is "McCracken" and the background — well, congratulations, Upper Deck.